Whatever you happen to call it… Binge Eating, Emotional Eating, Compulsive Overeating, Deprivation-Driven Eating, Food Addiction…A Weigh Out offers a way out of the self-defeating cycle of disordered eating, dieting, weight obsession…and shame. Specifically, we’re here for people who are tired of feeling out-of control with food and who wish to be at peace with their body. Our specialty is working with people who use food, food thoughts, dieting, and/or a weight obsession to distract from thoughts, feelings, or life situations they’d rather not tolerate. “If I don’t want to be mindful, I can go mindless with all-consuming thoughts about food and how much I weigh”. For some people, being food-focused is a backlash from years of food restriction and dieting. Others find themselves having food and/or body dissatisfation thoughts when they feel any intensity of feeling they would rather avoid. Some people are conscious of when and why they become food-focused, others do so unconsciously. A Weigh Out offers new tools and skills for mindful living and emotional regulation. A Weigh Out provides cutting edge coaching and a supportive online community open to people who live anywhere in the world, and therapy in Greater Cincinnati. Our approach is “Health at Every Size”. Our emphasis is on healthy balanced living; on emotional, physical, nutritional,and spiritual health, not on weight. A WEIGH OUT is a paradigm founded by Ellen Shuman and developed at Acoria Eating Disorder Treatment, based in Cincinnati, Ohio. Our parent company is WellCentered. Inc. We have been in operation sinch 1993. I’m Ellen Shuman, founder and director of A Weigh Out Life Coaching Programs, Acoria Eating Disorder Treatment, and WellCentered Life Coaching. I bring to these efforts much passion and many resources; professional and personal (I am in recovery after decades of emotional eating and a full blown binge eating disorder). In addition to my Directorship and fulltime work as a trained Life Coach, I’m currently the Vice President of the Binge Eating Disorder Association (BEDA), and the Co-Chair of the Academy for Eating Disorders Special Interest Group on “Health at Every Size” (HAES). I am actively involved in the HAES paradigm as both a researcher and a practitioner. With neuropsychologist Mary Boggiano, Ph.D, and the University of Cincinnati, we have published in the field of Binge Eating Disorder, in peer reviewed journals. We currently have a study underway with the psychology department at the University of Albany, Drew Anderson, Ph.D., and Deb Burgard, Ph.D. To particpate in this study, the “Sustainable Health Practices Registry”, please click here. Because of my own decades of struggle with emotional eating and a binge eating disorder, I know first hand what most visitors to this website are experiencing! Like many people, I blamed my problem on what I (and society) labeled “a lack of willpower”. But even before I knew I had an eating disorder, that didn’t make sense to me because I had lots of stick-to-itiveness, even hyper vigilance in some other areas of my life. So why couldn’t I stop my compulsive over eating? When I was finally diagnosed, therapists called what I had, “atypical bulimia” because I binged but I didn’t purge… and they didn’t know what else to call it back then. Today it has a name of it’s own and those of us in the binge eating disorder field are working hard to get this Binge Eating Disorder the recognition that it, and those of us who struggle with it, deserve! To learn more about my personal struggle and recovery from binge eating, I hope you’ll join us for one of our Free Telephone Seminars, “Conquering Emotional Eating”. I also write extensively about overcoming compulsive overeating, emotional eating, and Binge Eating Disorder in our Members’ Blog, “Weigh This Instead”. For access, consider a Free Trial or learn more information about Membership by clicking here. In 1992 I was a special projects reporter at WCPO-TV, a network affiliate in Cincinnati. One day, as I was looking for story ideas, I happened upon a New York Times article about a new classification of eating disorder: “Binge Eating Disorder”. I read the proposed diagnostic description. This was it! I knew that this was exactly what I had been struggling with most of my life. This very real problem was finally getting some recognition in the medical and mental health communities. I wanted everyone to know that this was a legitimate eating disorder, not just “a willpower problem”. So, I produced a series of news reports on the subject. 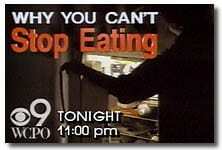 While I was working on my news series, “Why You Can’t Stop Eating”, I had a conversation with a former colleague of mine who then worked for The Oprah Winfrey Show. 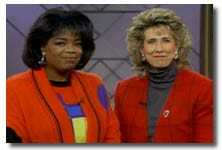 She mentioned that Oprah was planning a show on a related subject: Women’s relationships with food. Since WCPO was an “Oprah station”, and since local news departments are always looking for cross promotion opportunities for sweeps months, my bosses decided to air my project the very same week as Oprah’s show. “You’re kidding”, I said. Then she asked, “Would you be willing to talk to the show’s producer?” About thirty seconds later the producer called and talked about how important it was to “get this subject out of the shadows”. I had said almost the exact same words to every person whom I had convinced to appear on camera in my television series. After some consideration, I said yes. As the taping began, all eight of us were amazed at the immediate comfort we felt with each other. We knew we were in a room full of women who “got it”, who understood the pain. (I want our Members’ Circle to create the same safe and understanding place.) Even with my television background, I lost track of the fact that there were cameras rolling. I am so grateful Oprah Winfrey had the courage and willingness to so openly share her own struggles with emotional eating in such a public way. If it were not for Oprah, and my experiences on her show, it is very possible the A Weigh Out Community and Acoria would not exist today . Everyone talks about “The Oprah Effect”. I was touched by it, and am grateful in more ways than I can express! It turned out this subject touched many more people than I ever could have imagined. The phone calls and letters I received immediately following the airing of the two Oprah Shows and my news series were incredible …in both number and content! (The whole experience was incredible!) Frankly, I didn’t know what to do with all the people who contacted me. They were looking for real help. So I started doing more research and began offering free seminars on Binge Eating Disorder at a local hospital. But information about binge eating just wasn’t enough. These people who were strugging wanted to know how to actually change the patterns that were keeping them stuck. They wanted practical help. So, I sought out others who were interested in designing treatment options. And before I knew it I was learning everything I needed to know about running a Binge Eating Disorder Treatment Program. Then, in 1996 I discovered “Coaching”, both personally and professionally. Citing my research background, eating disorder treatment program development experience, and my personal knowledge of what it’s like to have a binge eating disorder, my own Coach strongly encouraged me to go through a life coach training program she developed (The Institute for Life Coach Training). I loved the training and I loved working with my coaching clients! I was hooked! I have been coaching and loving the work for thirteen years now. To date, I have coached people in the US, Canada, France, Great Britain, Australia, Israel, Ireland, and Trinidad and Tobago. Regardless of the longitude and lattitude, the pain associated with binge eating, compulsive overeating, and emotional eating knows no boundaries. Feeling out-of-control feels bad, in any language! In August of 2007, A Weigh Out and one of my Coaching Clients were featured in an O Magazine Article About Emotional and Binge Eating. Here’s how that came to pass. One morning around 8:00 I received a call from Emily Yoffe, a reporter who was writing a story about binge eating disorder for O Magazine. The impetus for the story was a 2007 Harvard University and McLean Hospital Study (Hudson and Pope) about the widespread incidence of binge eating disorder. According to the study, binge eating disrupts the lives of 3.5% of US women and 2% of US men for an average of eight years…which means binge eating disorder impacts more people than anorexia and bulimia combined. The O reporter had gotten my name and A Weigh Out’s phone number from Mary Boggiano, Ph.D, a psychologist and researcher at the University of Alabama at Birmingham. She studies the neurochemistry underlying binge eating behavior. (Dr. Boggiano is also included in the O Magazine article.) While most of her studies are done with rats, Dr. Boggiano and I have published research that explores “chaotic eating behaviors” in humans with Binge Eating Disorder (Behavioral Medicine, 28, 99-105) and we are about to begin a new study that I can’t talk about, quite yet…details to come. Since Dr. Boggiano works with rats, and the reporter needed information about humans with binge eating disorder, she suggested that the reporter contact me. At 8:30am, the O reporter asked me if I could find an A Weigh Out client who would be willing to be profiled in her article on binge eating disorder. I’ve gotten numerous requests like this from reporters over the years and I always find it a bit uncomfortable to approach clients with this question. Having told my own recovery story on the Oprah Winfrey Show in 1992, I know it takes soul searching and guts to go public with a problem that held so much shame for so many years. (Also, I never want my coaching clients to feel pressure to go public, just because I’m asking.) So, as always, I told the reporter that I would think about her request. I said if someone came to mind, I would contact that person and give him or her the reporter’s name and number. Then I put this request out of my mind because I had a coaching client calling in at 8:45am and I needed to get ready for the session. We believe healthy people come in all shapes and sizes. Diets don’t work for Emotional Eaters. Diets are about food restriction. Diets never address the core reasons why a person might be over using food… and often the deprivation that comes with dieting drives bingeing. Some people use “food thoughts”, food, and/or dieting behaviors to take care of emotional needs. When we fill our head with a food or diet thought, we temporarily push all other thoughts or feelings from our present consciousness. When we’re bored, stressed, angry or lonely, even when some of us get excited…to avoid the intensity of feeling, we might develop a habit of obsessing about food instead. Emotional overeating happens on a continuum. At the far end of that continuum, this method of self-soothing can become a person’s primary coping strategy…a person’s only way to self-comfort and to regulate mood. We recognize and respect the power of food when it is used as a coping strategy. It works…at least for a little while…then we feel like our best friend has betrayed us…and more food thoughts come with a vengeance. We respect the resilience of people who have come to use food to take care of their emotional needs. They have likely made it through some pretty difficult emotional times, by having food at their side. We understand that emotional eating and deprivation-driven eating impacts a person’s ability to live his or her life to the fullest and to achieve desired physical, emotional, nutritional, and spiritual health. We honor the pain that results when this coping strategy seemingly takes on a life of it’s own…and robs a person of his/hers. We believe change occurs when the problem is approached with new insight and “self care” in all four of these arenas…emotional, physical, nutritional, and spiritual health. We trust that, with support and new understanding, a person can come to view change as a relief…and as an attainable choice. We know, from experience, that working through the feelings that drive a person to eat can be an amazing (and challenging) process…but, that this process is nowhere near as painful as staying stuck in the problem. We know it takes courage to seek and ask for help. Change is a process. It begins when a person feels safe enough to start “trying on” new behaviors. For you, this process may begin with a Free Telephone Seminar , or partnering with an Emotional Eating Coach…or with our A Weigh Out Members’ Community. Find your own safe and empowering place to begin!